Kiso-Fukushima Ski Resort (きそふくしまスキー場) is located Kiso, Nagano prefecture. It has 9 different courses and its longest courses is 4,600m long. 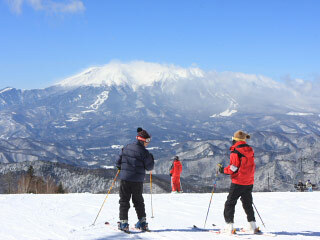 On the top of the slope, it has a great view of Mt. Ontake. It is ski only slope. Kiso-Fukushima Ski Resort has free shuttle buses from Kiso-Fukushima Station. Also, it has rental service for all Ski gears. So, it is a very convenient ski resort because it has free shuttle bus from the station and rental service for all ski gears. You can visit here with empty hand. There are parking, restaurant and resting place. Day pass: 4,200 yen for adult. 2,700 yen for kids. Rent all gears: 3,500 yen for adult. 3,000 yen for kids. Kiso-Fukushima Ski Resort is one of the popular ski resorts located in Kiso, Nagano Prefecture. It has 9 different courses from advanced slope to kids slope. It is Ski only resort. There is ski lesson and rental service for Ski gears. It has free shuttle buses from Kiso-Fukushima Station in the morning and free shuttle buses from this ski resort. From the courses, it has a great view of Mt. Ontake.